With land degradation in dryland regions continuing to worsen, the UN Convention to Combat Desertification has agreed on scientist-recommended indicators for monitoring and assessing desertification that signatory countries must report on. The landmark agreement was reached after two weeks of negotiations involving hundreds of scientists and government ministers attending the Ninth Session of the Conference of the Parties (COP 9) of the UN Convention to Combat Desertification (UNCCD) in Buenos Aires, Argentina, from 21 September to 2 October. Desertification, land degradation and drought deprive people of food and water and force millions to leave their homes. Desertification refers to the creation of new deserts through the degradation of drylands, which cover 40% of the worldâ€™s land surface. Land degradation, caused by over-cultivation, over-grazing, deforestation and inefficient irrigation, affects roughly 20% of Earthâ€™s drylands. Since dryland desertification can be remedied or even reversed by using appropriate management techniques, scientists attending the first scientific session of the COP, held from 22 to 24 September, stressed the importance of developing science-based methods for monitoring the areas most at risk to support land and water management decisions. Satellite technologies were recognised as playing an important role in achieving this objective. ESA has been working closely with the UNCCD secretariat for nearly 10 years, developing and demonstrating innovative information services based on satellite Earth observation (EO) technologies that allow land degradation processes to be monitored over time. Monitoring desertification, land degradation and droughts requires the continuous evaluation of a complex set of parameters and indicators, some of which can be retrieved with EO technologies and state-of-the-art geo-spatial applications. For instance, the status of land cover â€“ one of the 11 indicators defined by COP â€“ can be monitored from space. In 2004, ESA launched a large pilot project called DesertWatch to develop a set of land degradation indicators based principally on land surface parameters retrieved from satellite observations. These indicators were developed with the support of Italy, Portugal and Turkey â€“ three of the European countries mostly affected by desertification. DesertWatch also helped these countries fulfil their UNCCD reporting requirements by combining satellite data with weather and in-situ data, numerical models and geo-information systems to create standardised geo-information products. ESA recently extended the project so that its methodology may be adapted and put to wider use. To demonstrate its applicability, the methodology will be applied to arid and semi-arid areas in Portugal, Brazil and Mozambique. According to the UNCCD, soil moisture is another key parameter that should be monitored, because it is an indicator of water scarcity and vegetation stress. Soil moisture data can also be used for assessing drought risk. 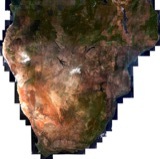 The ESA-backed SHARE (Soil Moisture for Hydrometeorological Applications in the Southern African Development Community Region) project has developed a pre-operational soil moisture monitoring service with the long-term goal of supplying free soil moisture information for all of Africa, at a resolution of 1 km, via the Internet. 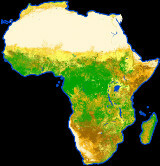 SHARE was developed under ESAâ€™s TIGER initiative, which helps African countries to overcome water problems. DesertWatch and SHARE are funded by the Data User Element (DUE) under ESAâ€™s EO Envelope Programme. ESA hosted an exhibition booth and a side event at COP 9 entitled â€˜Earth observations from space for the UNCCDâ€™, where the latest DesertWatch findings and results were presented. The side event also served as a platform for demonstrating the benefits of EO technology for the UNCCD Convention. Speaking of DesertWatch, Dr Lucio do Rosario of the Portuguese delegation said: "We recommend the UNCCD Contracting Parties to adopt these methodologies. The benefits are multiple. They improve the monitoring and assessment of land degradation, provide more efficient decision-making and facilitate the reporting to the Convention on the indicators adopted by COP 9." In a message to COP 9, UN Secretary General Banki-Moon said: "In addressing climate change, the international community has tended, quite understandably, to focus on cutting greenhouse-gas emissions. But tackling the issue in all its complexity also requires to go beyond mitigation and take into account the intrinsic linkages between desertification, land degradation and climate change." ESA will continue to act on both fronts by helping the UNCCD community develop monitoring and assessing tools and supporting the UN Framework Convention on Climate Change (UNFCCC) community with long-term trend analyses of essential climate variables. The Tenth Conference of the Parties of the UNCCD will be hosted by the Republic of Korea in October 2011.